Logitek is an audio console company. Why develop an audio codec product? Between the coming ISDN shutdown around the world and recent regulatory changes in the US, radio is anything but business as usual right now. Logitek and Logitek Australia set out to create an alternative to clunky hardware codec boxes to slim down your remote kit. Plus, as everything in radio becomes virtualized, we know that everyone is going to need better ways of transporting audio. The JetLink beta is just the beginning of a series of useful tools from Logitek to create great radio today… and tomorrow. The beta is free. But what is this going to cost? We’re still working all of that out right now, and we will be surveying our beta testers to determine the right feature mix and price point. Right now, it looks like we’ll have a free tier that covers all of the basics, which is what you see in this beta release, and we’ll have additional features available for a nominal price. Can I still join the free public beta program? Absolutely. Just click here and enter your email address to sign up. After you’ve registered, you’ll receive a link to download the software. We’ll email you periodically new versions for you to try. (We’re aiming for one release a week.) We encourage you to click the Feedback button in the program to send us your comments. You can also email support@logitekaudio.com if you need help with anything. With each release will be a set of release notes. This will tell you what’s changed since the last release and any known issues you should be aware of. 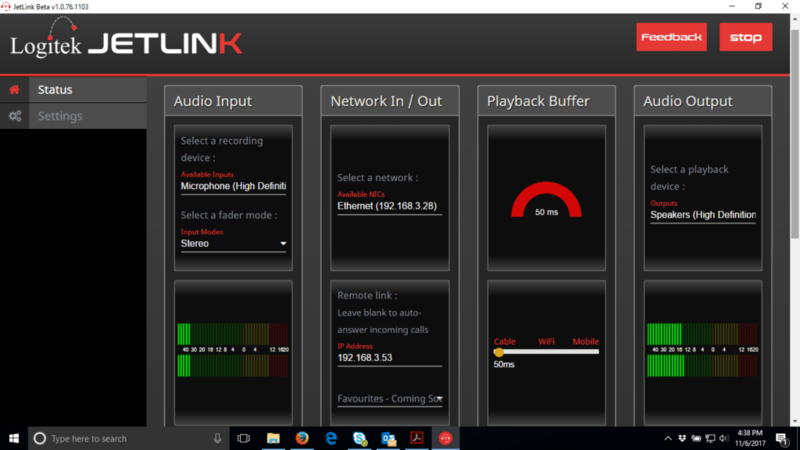 JetLink is working great between two computers on my local network. How do I connect two computers over the Internet? If you’re behind a router/firewall, you will need to set up port forwarding to point UDP Port 5006 to the PC running JetLink. We realize that not everyone has the knowledge (or administrative rights) to set up port forwarding, and we’re working on a way for JetLink to transverse a firewall without changing the router. When this is available, this will be a paid feature.